Citation: C N Trueman "Canterbury Cathedral"
Little actually remains of the original cathedral or of the Norman cathedral built by Lanfranc who was appointed Archbishop of Canterbury by William the Conqueror in 1070. However, written accounts by the likes of Bede do give us an idea of what the cathedral looked like in its original form. The monk Eadmer described how the cathedral looked before the fire of 1067 and how it looked after the rebuilding was completing under the supervision of Lanfranc. Gervase provided a written account of what the choir section of the cathedral looked like during a period of reconstruction in the late 12th Century. The sheer size of Canterbury Cathedral meant that money was always needed to pay for its upkeep. There were times when not sufficient money was available. The nave built by Lanfranc survived a fire that hit the cathedral in 1174 but it fell into disrepair and decay. In the late 1370’s the condition of the nave was such that Archbishop Sudbury ordered work to begin on a new nave. Henry Yeveley, a master mason to Edward III, was put in charge of this. The work took twenty-five years to complete and can be seen today. Previous work in the nave limited the length and width that Yeveley could work to. But there was no such limitation with regards to height – except for the obvious engineering reasons of the time – and from floor to vaulting, the nave is nearly 80 feet high. In the late 16th Century a stone girder was placed above the altar to ensure the stability of the cathedral’s huge central tower. The tools that a master mason had to work with were limited – hammers, chisels, crude measuring devised, wooden scaffolding etc. However, for all these limitations, the professional skills shown at Canterbury are best seen in the central tower, known as the Bell Harry Tower. The ceiling, where men would have worked on their backs on top of less than stable scaffolding, is both highly decorative yet functional. The tower is 235 feet high and the weight of it is contained and distributed through the fan-shaped vaulting, which ‘carries’ the weight to the foundations. The immaculate geometric ceiling of Bell Harry is one of the great glories of medieval architecture – done for the ‘greater glory of God’. At the eastern end of the cathedral is a massive stained glass window that shows stories from the Bible. Beneath it is the patriarchal chair (cathedra), made of Purbeck marble, on which since the 12th Century all archbishops have been enthroned. It was originally thought that this chair was the one used by St. Augustine as his cathedra, but it is now accepted that the chair came about during the time when the choir was reconstructed. It was in the vicinity of the cathedra that the scalp of Thomas Becket was displayed. Among these jewels was the ‘Regale’ ruby that was later taken by Henry VIII. 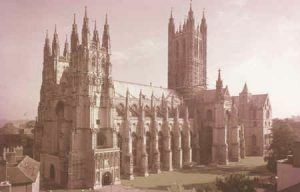 Accurate figures for the number of pilgrims who went to Canterbury are not easy to gain but it is said that in 1420, 100,000 pilgrims made their way on their knees along the nave to Pilgrim’s Steps.